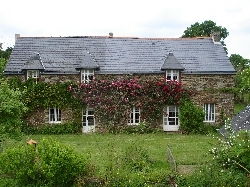 Cottage in Brittany, France; Situated in a quiet hamlet close to the Canal Ille-et-Vilaine our traditional 2 storey Breton Longere has been restored to an excellent standard, while still retaining its French charm & character. 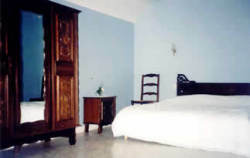 It is set in a fully fenced extended orchard garden with swimming pool. Through the French windows, opening from both the kitchen & lounge rooms, there is a sunny, south facing, totally secure lawned area with garden furniture, barbeque & table tennis for your use. The orchard garden is an area where the more energetic may wish to play football or other games which may require more space. 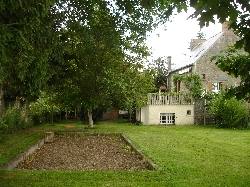 This area also contains a boules court where you can try out your skills at the local pastime. We offer an ideal base for all sorts of activities, especially golf, cycling, fishing, sightseeing or just lazing about. Along the motorway ( 5 minutes from the gite ) the medieval city of Dinan is just 15 minutes away; the beautiful beaches of the Emerald coast 25 minutes, while the principal city of Rennes is 35 minutes away. 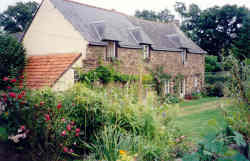 Our gite nestles in a tranquil hamlet of rural Brittany in an ideal position to take advantage of the pleasures & richness of Ille-et-Vilaine � 5 minutes from the main route linking the channel port of St Malo to Rennes, Brittany�s historic & picturesque capital. Good food is an attraction of the area. Cancale & the Bay of Mont Saint Michel famous for seafood & pancakes. With the greatest tide range in Europe the �Emerald Coast� stretches from the Bay of Mont Saint Michel to St Briac, via the typical fishing port of Cancal, the pirate town of St Malo & the elegant Dinard. Inland you will find magic & legends � Brocelianda forest, home of Merlin; Rennes capital & historic centre of Brittany; fortified towns of Combourg, Fougeres & Vitre. Facilities for messing about in boats abound. Byways & footpaths criss-crossing the landscape are ideal for walkers & cyclists. Ille-et-Vilaine is also a byword for seawater therapy & for the 9 excellent golf courses. A thousand pleasures await you in Brittany. Bon voyage through its history, its geography, its legends & its dreams.